Picture(s) of: table conversations at the just finished Outside In Storytelling Marketing Boot Camp; participants talk with a real-live accountant and I am happy to report that none of them died during the discussion; table full of paperwork, forms and handouts. Busy place we were. 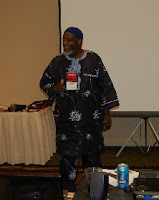 Pictures of: moments from the Outside In Storytelling Marketing Boot Camp. Going across the top: two folks work on the CD evaluation lab; cheesecake- my goodness we are having a lot of food; small group session on mission statements; a participant doing a five-minute surprise performance- one of four different folks today; wide view of the camp participants and me teaching at the front of the room. Today I: taught at and learned at and participated in the camp; ate dinner with some of the participants on our "free evening" night; came home and wrote you this blog; did a few more handouts for the last day tomorrow; Happy Birthday, Michelle. Picture of: the first teaching and learning session of the night camp. Storytellers and musicians. Today I: told stories for children at an elementary school; kicked off the first night of the camp. I am very very tired storyteller. I am very very happy. Picture of: some of the folks at the registration table for tonight's camp experience. We have really nice bags and even nicer learning experiences planned for the OISBC. Picture of: me and Liz laughing as she comes to the registration table. Picture of: some of the participants of the Feb 2008 Outside In Storytelling Marketing Boot Camp as we began tonight. GREAT group of people from all different types of motivations and portions of the U.S.
Picture of: Priscilla Howe sharing puppets with my daughter at the OISBC event, during dinner. It was a beautiful night for some alfresco dining. Picture of: participants talking at the end of the night for the "cookies and milk" closing of the first night. 02.26.2008 Tuesday: The Marketing Camp Eve. 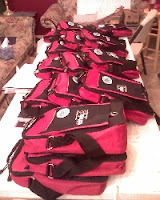 Picture of: the final, filled, and stacked bags for the marketing camp participants. My wife and children put in hours of work tonight pulling this feat off. Thank you, thank you. Today I: spent, as the last several days, putting together the manual for the Outside In Storytelling Marketing Boot Camp and I believe now that Kinko's is building a shrine for me; sent a storytelling invoice to a regular client; sent more Storytellingproducts.com orders out; Happy Birthday, Dad. 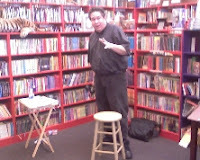 Picture of: me storytelling at a local "non corporate" bookstore in the children's section. Today I: told stories to children at this local bookstore for their "Love of Reading" week. Truly one of the most bizarre storytelling events I have done. The store apparently did not get any advertising out for the event (personnel change) so no patrons knew I was going to be there. There were NO children there when I began with the exception of my two who dutifully sat in the chairs (thank you, precious ones) hoping others would come. They did. They came. They stayed, they moved on. Others came. 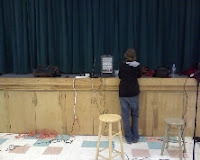 Some participated in the longest, funniest, audience-wrapping version of the Lion and the Mouse I have ever done. Really, it was me the giant, loud storyteller just telling into the air at some points. Totally surreal experience. So grateful to sponsors and the good staff there, but oh, this was odd. Side note: one guy started to do a mime act right next to me at one point. So good to know he majored in recreational drugs and theater in high school. This was kind of like a Fringe for the kindergarten set. LOL. 02.22.2008 Friday: Cut to Bleed. 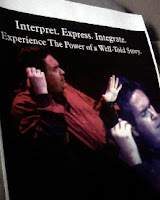 Picture of: the pre "cut to bleed" printout of a new storyteller poster I had done for my storytelling work. Today I: spent almost every moment working on some type of paperwork, PowerPoint, order form or other information piece for the Outside In Storytelling Marketing Boot Camp. Launching a new multi-day event is an enormous undertaking. I do know (from experience) that it gets easier the second and third time you present the same event; I also spent too long trying to track down contacts for hotel space. What a crazy industry that hotel-space industry is. At one hotel, when I finally got a working relationship going with one salesperson, they tell me that he's gone on to other things now. Nuts. 02.21.08: Thursday: Meeting Space. Mania. 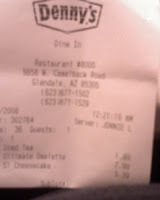 Picture of: my receipt from Denny's. 12:21AM it says, started at 10:46PM on the 21st, so does this picture count? Today I: did the banking for the Marketing Camp; paid the big bill at the hotel; ate lunch with my wife; worked on my new "one sheet" (I'll post the link Friday) for a long time -if you don't know what a "one sheet" is or how it is used, you should come to the workshop. Only recently am I getting actual requests for the one sheet from booking sponsors, that is a good sign for storytellers; ordered pizza and watched my kids play Toontown; spent two hours in Denny's tonight organizing the manual for the camp, looking for missing pages and so on. I forget what a lesson in humanity it is to sit in a Denny's late at night, it has it's own, umm, life to hear what people are really concerned about in their own (mostly young) lives and storytelling ain't it even tho' they are story telling to each other for an hour each in those booths. Maybe they are. I confuse myself with all these opinions I have. 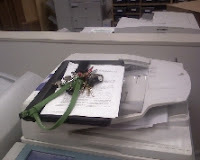 Picture of: the copy machine at my local Kinko's store. I know I am there a lot when the clerk behind the counter says, "Just self-serve? Nothing for me to run tonight?" They are good people there and way overworked. Too much Fedexing, not enough time for printing. Today I: made huge headway in getting the manuals finished for next week's marketing camp-- there is still space if you want to squeeze in there--you gotta contact me now; talked on the phone with the contact for Wednesday's school show starring a local storyteller named me; talked to the hotel contact for the May 10, 2008 Austin, Texas gig-- she was not sure what vegetarians eat, i.e, what would a vegetarian put on a sandwich. She was fun (really) to talk with. 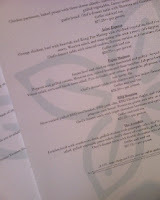 Picture of: the menu lists from the hotel where our Outside In Storytelling Marketing Boot Camp will be next week. Today I: had my regular Monday morning staff meeting; spent time finishing the menu for the storytelling marketing camp; finished the paperworks for the Austin, Texas "Storyteller.net Live" event on May 10, 2008--stay tuned; posted a new blog on personal stories; reminded myself that it is okay to let things go on without me bu to be sure that I say what I mean; "The price of clarity is the risk of offense." 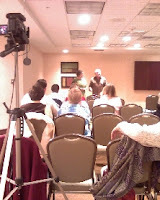 Picture of: me telling at our Storyteller.net @ Borders event we hold the third Saturday of every month. This storytelling picture had some odd lens thing going on and it turned out like an oil painting. Odd. Today I: secured the Austin, Texas location for the new "Storyteller.net Live" event on May 10, 2008; told stories at Borders in the evening- someone said my Cinderella was brilliant ; had dinner with my wife, kids and mother- lovely little after-Borders tradition. Picture of: me telling at the "Crazy Love" stories event at Christ Community Church in Tempe this evening. Photo credit today to Mark Goldstein. Today I: spent time on the phone with several people one who is willing to collaborate on projects and one for whom the word "collaboration" is not in her lexicon; spent more time on the phone with hotel reps from southern California- folks, if we want to have the "Storyteller.net Live" event in the L.A. region, they you have to help me find an affordable place to host it- yikes; in the last 24 hours had some of the most mind bending emails in a long time- great honesty in some and great cowardice in another and all in the same day; wrote about smoke and mirrors; made a major CEO decision that my Owner side doesn't like; told stories at an Arizona storytelling church- wonderful audience, great tellers, fine environment- just a memorable night of telling in Arizona. We have some of the most gifted storytellers in our area as well as folks who can provide support and services for each other. I am proud to be at storyteller here with you in Arizona, my storytelling friends. 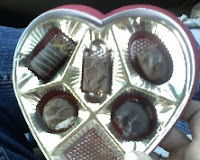 Picture of: the chocolates in the gift box my wife and I gave to each of our children today. Please note that this box is from the nine-year-old who took a bite from each piece (you can see the bites) as soon as she opened the box. She wanted to test each one to figure out which she would eat first. I want to be nine again. Today I: was generally ill but managed to take some time to go out to lunch with my sweethearts. That was fun; learned that my health insurance has gone up $125 per month starting next month, yes, please come join the wonders of the self-employed storyteller; talked with the hotel contact regarding the Marketing Boot Camp schedule and we'll talk about meals on Monday; traced my anonymous friends' email to Virginia and Tennessee- hey at least I sign my opinions; prepared my story work for Friday night's concert. 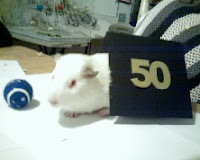 Picture of : Phineas Phig the Guinea Pig. Please note that he is playing on the table underneath my invitation to the "50th Anniversary Edition of the Grammy Awards" held last week. I didn't go, I didn't have the right clothes. LOL. Mad props to the Recording Academy folks for nominating real storytellers in the last few years. Today I: was locked in my office doing storyteller paperwork, spending too much time answering Emails that won't move things forward; stood in line at the post office which I never do any more and talked about the "Storyteller.net at Borders" event with the guy who handles my POBOX mail; didn't have a school gig today as they are all doing conferences; finally escaped last night with my wife to go eat a salad before I lost my marbles sitting in front of this darn computer; came home to find Phineas wandering about the table with my Grammy invites. He said they were delicious. Picture of: the sign in the fast-food place that demonstrates the value of knowing your customers and being focused on their needs. Today I: spent most of my day starting to have all the parts of the "Outside In Storytelling Marketing Boot Camp" form into a single narrative manual. Much work; worked on the new "Storyteller.net Live!" event we are releasing around the country very soon; spent way too much time at Verizon trying to resolve a phone issue; picked up my kid from work and found this sign which will prompt my next blog on "Will and Tacos" regarding the power in knowing your audience. By the way, if you still want to come to the Camp in a few weeks but are staying away because of finances, then contact me. See, this is the blog with the secret surprise inside. 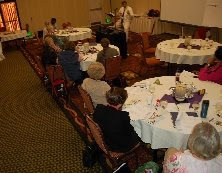 Picture of: the view from the back of the room during the Arizona Storytelling Guild's "One Story, Many Voices" event. Today I: fought through the FMS fog; worked on storytelling flyers; prepared my story for the AzSG event tonight; talked at length with the sales staff at the hotel where the meeting was held; participated in the presentation and follow up discussion at the guild meeting-- the follow-up was a brilliant 40 minutes of discussion of which only the last 17 minutes got recorded...mmm, technology. We will make a podcast of the stories and the discussion we did catch on audio. Great night for storytelling in Arizona. Picture of: two discussion groups talking about the stories during the adult retreat I led yesterday at a church in Arizona. Last week, I led teenage guys. This week, I got to lead adult singles. I love the variety that I get to work with as a storyteller. The building we were in has so much well-planned ambient lighting that we don't even need to turn on the electric lights during the day. Great building. I get to use it every few years or so. Today I: took my eldest to work early in the morning; made my way across the city to the retreat location; led a day-long retreat with stories, discussions and activities for a Methodist singles groups; picked up previously mentioned kid from work; came home and crashed--tonight the FMS wins. 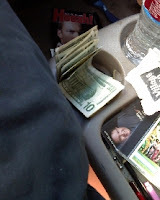 Picture of: the thing in my car where I put all my stuff. It's not the dashboard but rather the space in between the front two seats of the van. Today I: sent a note out to all the members of our Storyteller.net directory advising them of some changes; figured out where to put money this week, which bill now, which bill Monday- hence the money in the picture above; spoke with the sales staff of two hotels, one here in Arizona and one in Texas, about upcoming events; worked on a flyer for those upcoming events; finished the outline for the retreat presentation I am giving on Saturday and being happy that this weekend I do not have to fly to the event; got a great idea for the "Many Voices" piece we are doing at the AZ Storytelling Guild meeting on Monday; took my family out to dinner at Subway. We had coupons. Today I: worked on paperwork for the Outside In Marketing Camp and picked up copies of the participants' homework from the post office (Yeah, homework. This is the real deal at this camp. Come ready or don't come. LOL. ); did a storytelling school show for elementary school kids--the school divided the kids by age groupings and the event went great. The best of this series so far- the type where the kids all hold their breath waiting for the story to finish. Love it. ; had a big mid-week family party for the January birthdays in our clan. Even a casual pizza-and-cake school-night party still gets 20 people. 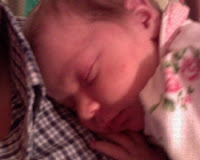 Bonus Picture: this is my newest niece, Ivy Winter, resting on my chest during the party. Been a long time since I held one this little. My hand is bigger than her body. My Brother#2 also announced that since Ivy is grandbaby #10, he and his wife wil be bringing in grandbaby #11 this Fall. Awww. Yes, I know this is a storyteller business blog, but what is business without the foundation of our families, which is what really counts, huh? 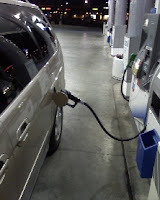 Picture of: getting petrol in the lorie late at night, when I finally got back out of the home office. I am often the last person at the gas station at night. I know I am the only storyteller, too. Today I: spent a long time (late late night) on the phone with one of my peers making my new "to do" list for the next several months- thanks "one of my peers" for your input; spent time on the phone with the program coordinator for the school program I am doing tommorrow; spent some time trying to figure out the right way to say to a few people.."have you thought about maybe you don't belong in full time storytelling? "; wondered why Tim wants to make me talk more; resolved once again to quit making political statements; got a nice note from one of my last-week's sponsors thanking me for my work with her freshmen boys group. 02.03.08 Sunday: Travel and More Travel. 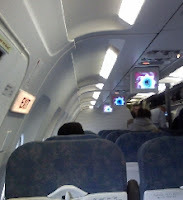 Picture of: my view from my exit row seating on the A319 aircraft- flying home from Baltimore to Phoenix. Today I: slept in a bit late at the hotel after my storytelling gig with adolescent boys yesterday; caught up on some storyteller paperwork; packed my bags and chased off housekeeping at 1250PM--I had a 100PM checkout, thank you; ate at a Bob Evans restaurant for lunch-- meh--I guess one glass of iced tea is considered to be a huge portion in the NorthEast; returned the rental car; got bumped OUT of first class; five hours across the U.S.; got to baggage claim and my youngest who still runs to greet me at the airport; drove home in the opposite direction of all the SuperBowl traffic; watched my youngest sing on video tape for her school co-op talent show; processed a new registration for the Outside In Storytelling Marketing Boot Camp; read a great christma s letter (yes they sent it in January) from a friend with the Xmas card picture of his really young adolescent boys--which takes us back to the start of this paragraph. Whew. Good night. 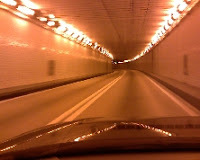 Bonus Picture: the inside of the Baltimore Harbor Tunnel from last night as I drove back to hotel. I am still southwestern-desert bred enough to still be the "country mouse in the city" when it comes to roads that go under water. 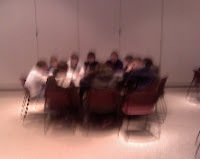 Picture of: some of the boys from the retreat I led today who are working on a small group project. Interesting day. Tough crowd. Good moments. Crazy moments. Today I: pulled a 15 hours shift doing this retreat and the evening storytelling concert for the church in Balitmore that hired me. I am Now crashing. Totally worn out. 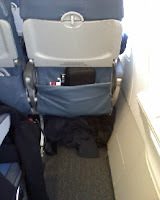 Picture of: all of my carry-on items securely stowed underneath the seat in front of me as well as my seatback in the full and upright position. Today I: travelled across the United States from Phoenix to Baltimore. I was in an exit row with no seat directly in front of me. Very nice.